Love your home decoration, too got beautiful accents for it through Hammacher Schlemmer. Oh, I love that red chest. What a great piece. I'm sure its a relief to have your classes finished up...for a while anyway. I couldn't even imagine taking exams while holding a job and manging a family. Oh, and the blue knit hat is too cute! Great job. Love the doll....she's beautiful! Hope the exam went well! I just emailed you about my swap, and your partner hasn't heard from you- drop me an email ASAP! Thanks Teresa!! xo! Teresa, she is just lovely. And, I would be loving that red chest, too. It must seem magical smelling all of the wonderful scents. That red chest made my heart skip a beat! Such lovely photos! I love the chest and doll and actually all of it. It's very Christmasy. I'll bet the smells are wonderful! Have a splendid weekend...quiet and relaxing with lots of time to get things accomplished. Congrats on finishing the class, too! I'm sure that you have earned a fantastic grade. 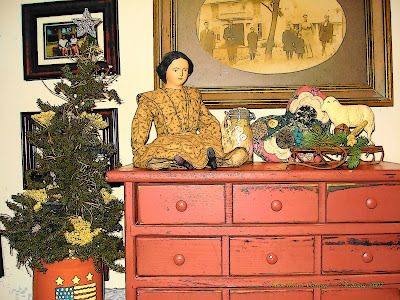 Love that red chest and the doll. Very nicely displayed. Something is wrong and I could not leave you a comment on your post for today, so I left it here. Happy Pink Saturday! I wasn't able to leave a comment on your Pink Saturday post. I love your collage. Is the ornament at the top left a rose? It is gorgeous. I noticed you haven't posted in awhile. I hope all is well! I miss reading your blog. Hope you are okay! Where are you? Getting worried about you. Peeking in...I can still tell that you've been here...hope that all is well with you. cool.. same as my cookie jars!